1. What Are the Pros & Cons of Annuities and Retirement Plans? If you work for an employer, then you may be eligible to contribute to the company's 401(k) plan. This can help you build retirement savings efficiently, in the hope of generating enough income for you to live on later in life. Annuities are similar in the sense that you make contributions in return for an income stream at retirement. 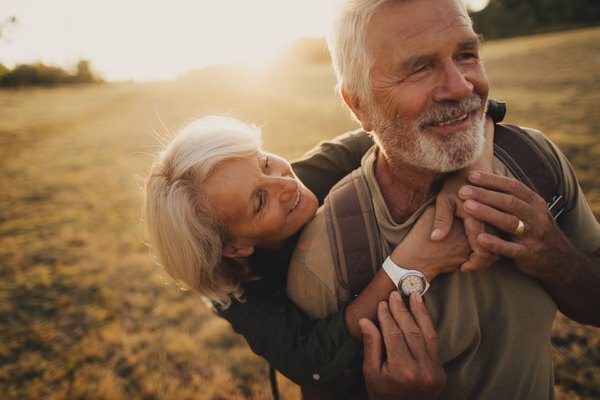 The difference lies in the annuity's ability to provide guaranteed lifetime income, irrespective of stock market conditions or how long you live. A 401(k) plan is a "defined contribution" employer-sponsored retirement plan, meaning you put in a set amount regularly. Eligible employees of the company take a portion of their salaries each month and dump them into their 401(k) buckets. If you're lucky, the employer will match your contributions. The money in the bucket is invested into various funding options such as stocks, bonds, mutual funds and exchange-traded funds. You might have dozens of different funds from which you can choose, depending on the plan. It's up to you how you reach 100 percent allocation based on your personal attitude to risk versus reward. For example, you could choose to invest the entire bucket into an aggressive stock portfolio, or you might put 50 percent into an aggressive fund and 50 percent into a conservative fund. Assuming you pick a good strategy and your investments make money, the rate of return is put back into your bucket and reinvested. This results in compound interest working in a positive direction so you have a larger bucket than the amount of your contributions when you retire. Fixed vs. variable rate annuities: A fixed-rate annuity pays out a predetermined, contractually guaranteed amount of income each year giving you a predictable income stream in retirement. On the downside, it doesn't provide a hedge against inflation – a $2,000 monthly payment might sound good now but the money might not stretch as far as you think it will in 10 years' time. With a variable-rate annuity, the income fluctuates depending on how premium payments have been invested. For example, the insurance company could invest the money in mutual funds or stock market products that can go up or down in value. With a variable product, you're trading certainty for potentially higher returns. Immediate vs. deferred annuity: You can buy an immediate annuity today with a onetime, lump sum payment and start receiving an income right away. With a deferred annuity, you make contributions now but must wait years, even decades, before receiving any income. Some longevity annuities are designed to delay payments until much later in life when your other retirement assets are spent down. Death vs. life annuity: A death annuity also includes a death benefit for your heirs like a life insurance policy does. With this option, your beneficiaries are guaranteed some percentage of your remaining payouts at your death. A life annuity pays out until you die and no longer. The income stream is based on your contributions and life expectancy. The younger you are when you start receiving income, the smaller your payouts will be. The Internal Revenue Service limits the amount you can contribute to a 401(k). In 2019, the limit is $19,000, up $500 from 2018, with a cost-of-living adjustment due in future years. Employees age 50 or older can contribute an additional $6,000 in catch-up contributions, meaning they can put up to $25,000 into the plan. The rules also allow employer matches providing an increased return on your investment. An annuity has no contribution limits. The only restriction is the amount of premium an insurer is willing to accept, which usually caps out between $1 million and $2 million. A 401(k) program is tied to an employer. The employer decides who's eligible for the plan, when they can contribute and how much. Annuities, on the other hand, are not tied to any workplace. You don't have to worry about rolling over the money into another employer's 401(k) program or an Individual Retirement Account when you change jobs. When a 401(k) leans towards stocks, the value of the bucket becomes heavily dependent upon the performance of the stock market at the point of retirement. Savers who walked into 2008 with $1 million in their bucket, for example, could have walked out of that year with just $700,000 due to the great recession and negative stock market returns. They had large losses on their portfolios that year, regardless of how much they were contributing to the 401(k) for all those other years. With annuities, you don't have to worry about a fall in your plan balance. During the accumulation phase, the provider invests the pooled deposits in high-quality investments in the hopes of generating high returns. But even if these investments plummet in value, you still get a guaranteed stream of income from a fixed annuity. The insurance company carries all of the investment risk. Most 401(k) plans have annual fees attached to them that are usually transparent. You can find out the fee from the plan provider. Some fixed annuities are advertised as fee-free, but variable annuities have fees in the range of 2.5 to 3 percent per year. Death benefit riders may come at an additional cost that can substantially reduce the investment gains in the plan. Besides fees, virtually all annuities have commissions attached to them. These costs tend to be built into the policy so you cannot see the commissions taken out each year. The lack of transparency can make it harder for you to make an informed decision when buying. If you are thinking of making withdrawals from your 401(k) but you are not yet age 59 1/2, you will be liable for the 10 percent federal penalty tax unless you qualify for a hardship exemption. The tax penalty is payable in addition to income tax on the distribution. Annuities also have early withdrawal penalties if you surrender the policy within a certain amount of time. However, the penalty tends to be lighter and gets less harsh over time. For instance, a deferred annuity with a 5-year surrender clause might charge you 10 percent on money withdrawn the first year, 8 percent the second year, 6 percent the third year and so on. After five years, there's no longer any surrender penalty. What's the Tax Treatment of an Annuity vs. a 401(k)? Both annuities and 401(k)s provide a tax-sheltered way to save for retirement. You will not owe income taxes on the investment returns of a 401(k) or annuity until you withdraw from the plan. Most 401(k)s are funded with pretax dollars. This means that contributions will lower the amount you pay in current income taxes. You may be able to invest in annuities through a 401(k), depending on the terms of your plan. Otherwise, it's possible to transfer a 401(k) to an annuity without paying taxes. Annuities funded with a 401(k) rollover are "qualified" plans, which means the insurance company can receive a check from your employer directly so there's no withholding on account of taxes. As always, it's a good idea to consult with a certified wealth professional before making decisions on the tax implications of any retirement vehicle. Are IRAs or 401(k)s Taxable? Can an IRA Withdrawal Be Taxed Over Several Years?